With Mother’s Day falling on Sunday 11th March (so early this year! Is it in your diary? ), it only seems fit we take this opportunity to celebrate mums everywhere. Not only did these wonderful women give us life, but their guidance and influence helped shape us into the people we are today. Who else would teach us that experimenting with hair bleaching ends only in tears or that an apple a day is what keeps the doctor away? For their worldly advice and silly anecdotes to unique little quirks and mannerisms, we wouldn’t have our mums any other way (most of the time ). In anticipation of this year’s occasion, we sent out a survey and lots of you joined in our Twitter chat. All with a view to sharing your funniest #MumMoments. We received a priceless array of stories featuring silly habits and the best words of ‘mum wisdom’ offered over the years. 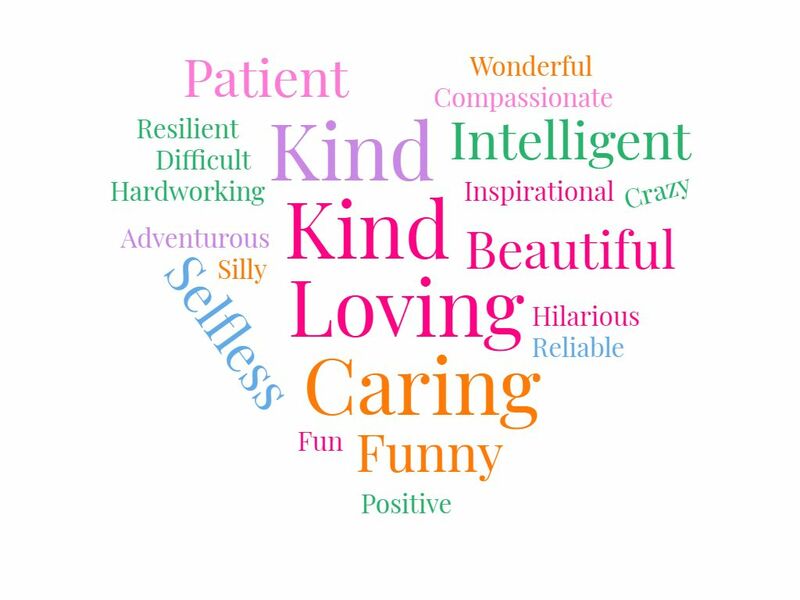 We started by asking you to describe your mum in three words. 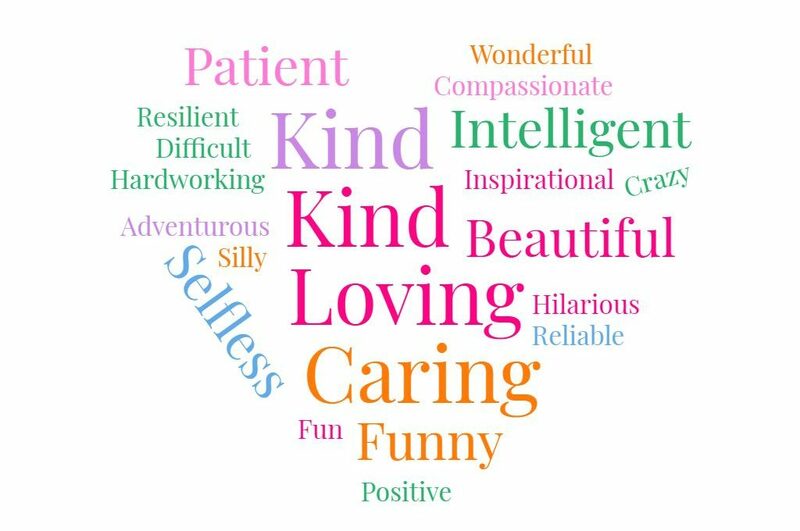 As you may expect, maternal characteristics like ‘caring’, ‘kind’ and ‘loving’ cropped up most and all the responses were translated into our word cloud heart below – do they describe your mum? 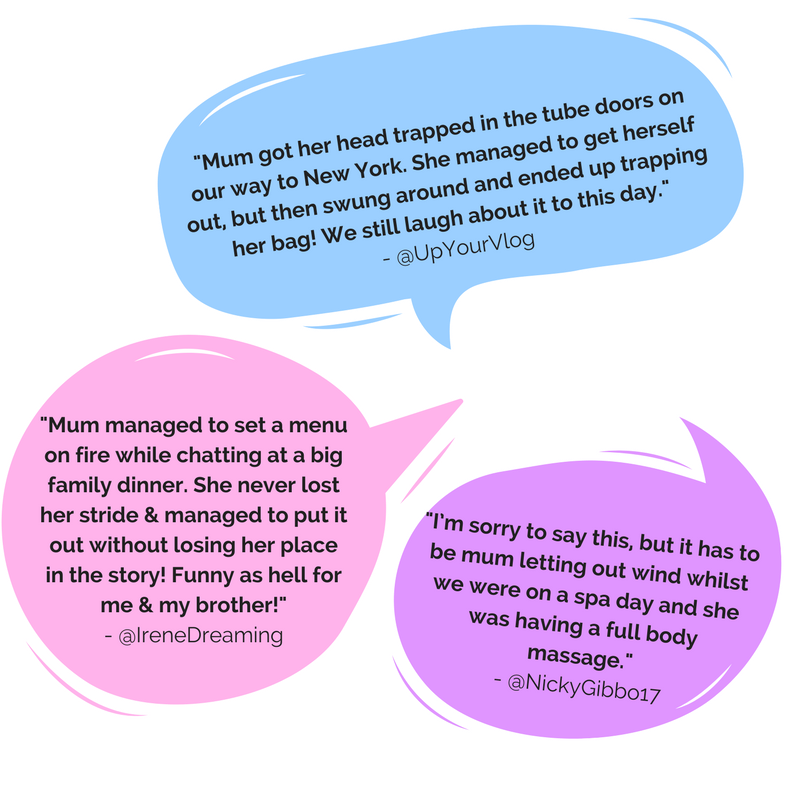 We loved hearing about your personal tales and experiences, and it really helped us to build an idea of what you love most about your mothers. With all the contributions in mind, we present the top five qualities that make mums the absolute best (like you didn’t know already!). Read on to see if you agree! 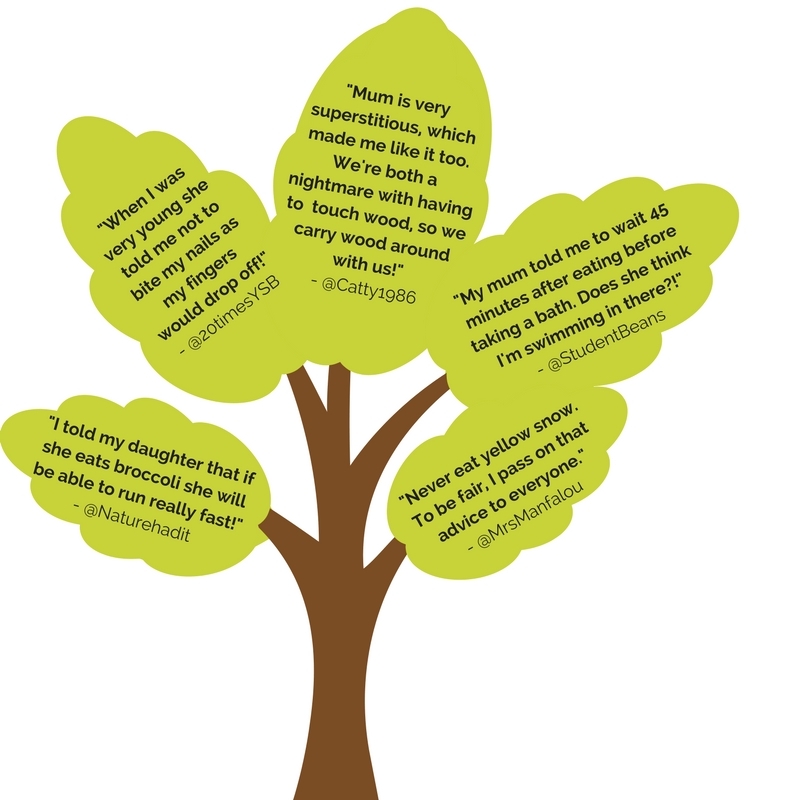 It takes just one glance at the word cloud above to spot the resounding theme – mums provide the nurturing touch; they are the ones that provide us with comfort through thick and thin. It’s clear that our respondents’ mums love their kids to the moon and back, and always offer their affection and support no matter what. From the heartbreak of a relationship breakdown or job rejection to the overwhelming joy of starting a family, mum wants and hopes to be by your side the whole way. From the days of babytalk and pulling faces at us as we cooed in our prams to wine-fuelled family fun in later years (FYI: see all wine experiences here), it turns out that mums provide the best entertainment! In fact, many of us owe our own sense of humour to good ol’ mother dearest. We asked you to share your funniest mum stories and you certainly didn’t fail to amuse us. You told us all about your mum’s clumsy mishaps, hilarious habits and quirky mannerisms. Squat farting? Amarjit’s mum sounds like a hoot! From day one your mum is your real-life superhero. She teaches you how to walk, talk, tie your shoelaces, tell the time, cook…you name it! As a child, she is your number one idol and you watch her in awe, as though she is some sort of otherworldly being. Mums always seem to know exactly what to do at any given time (and yes, we do mean ALL mums). Not to mention the fact that they somehow manage to juggle work, cooking, laundry, cleaning and looking after the kids all at the same time. As an adult, you realise that life isn’t quite as plain sailing as it may have once seemed, but your mum is your rock and her positive influence guides you through the ups and the downs of growing up. Whether she’s a working mum, a stay-at-home mum or even an honorary mum, the life lessons you pick up from this special lady will stay with you forever. Does your mum love to cook up a storm in the kitchen? Help her sharpen her culinary skillset with one of our cookery courses this Mother’s Day. On the topic of life lessons, this moves us swiftly on to your favourite pieces of classic mum advice. You know the saying ‘Mother knows best’? Well, they weren’t kidding. As funny as some things may sound, she normally has a valid point and there will most certainly be times that you look back and think “I wish I’d listened”. While there are heaps of important lessons to be learnt from mum’s words of wisdom, we wanted to know about the silliest advice she has ever offered up. From avoiding yellow snow to crazy superstitions, we found some of your ‘mum tips’ absolutely hilarious! As we transition from cheeky childhood years to terrible teens and finally adulthood, we discover that mum is not only a mother to us but also a great friend. Chances are you’ve started to turn into her by this point too. Take this as you will! You’ll laugh together, cry together and confide in each other. You’ll share good times, bad times and downright emotional times. And from all of this, you will discover there is no relationship that quite matches the mother and daughter bond. Not sure what to treat your mum to this Mother’s Day? Check out our Mother’s Day Gift Guide, for gifts to suit all nature of mums, from lavish luxury treats to awesome adventures! Alternatively, check out our Mother’s Day research from last year to find out exactly what mums want! Thank you to all of our respondents, we had a great time putting this together and could not have done it without you (check out the whole party at #RLDMums). And remember, our e-Vouchers mean you can choose her the perfect gift 24/7 and print it out instantly.